This is one way to organize your coupons, you have to find what’s right for you. If you prefer the binder method, make sure to check out our post on how to organize your coupons using the binder method. Finding the perfect way to organize your coupons is a challenge for most. I am still not sure that there is a perfect way to organize them. I am sure of two things however. First, I know that the “perfect” system is the system that works the best for you depending on your goals, time and couponing experience. Second, I know that switching from one system to another can seem like a very daunting task. Over the last week, I have done just this. I switched from one method of coupon organization to another. I decided that I was ready for a different system because my couponing goals have changed and I am a lot more skilled in couponing than I was a couple years ago when I set up my original system. As I started this task, I decided that I would document my journey and share it with you. I want to share with you the step-by-step process I took with the hopes that it may help you if you are considering taking on a similar endeavor. What system was I using before and why did I want to switch it out? I was using a very easy system. I had a hanging file folder box that I had hanging folders in labeled by the month. In each hanging folder, I had envelopes labeled with the different insert types – Red Plum, Smart Source, General Mills, P&G, etc. Every Sunday when the papers came, I pulled out the insert and wrote the date on the top corner and then filed them away under the appropriate month in the appropriate envelope. When I was ready to go shopping, I would pull up the online coupon database find the coupons I needed for my shopping trip and clip them. Why I liked this system? This system was really easy! Being a mother of two small children, I didn’t have to put much thought into the system. It was also very inexpensive to set up and didn’t take too much time every week. What I disliked about this system? Since I didn’t clip my coupons, I didn’t have them with me. If I got to the store and found that they were out of something, I couldn’t grab a new coupon on the fly. I also couldn’t create my own great deals in the store when I found that there was something on clearance and I knew I had a coupon for the item. I knew I needed to switch to a system that allowed me to bring my coupons with me. It needed to be portable and easy to use in the store. After some thought and research, I narrowed it down to the box system and the binder system and then I finally decided on the box system. I still needed something easy and the box system seemed to be the easier of the two systems for me at this point in time. How did I set up the new system and make the switch? Purchased my supplies – I went to Office Depot and bought a photo box and dividers. I spent around $20 for my supplies and the individual boxes inside the photo box proved to come in handy. You will also need labels but I didn’t need to purchase them because I already had some at home that I could use. Decided on my categories – This was the most difficult part for me. This is also going to be a very personal decision depending on your shopping habits. I broke my box up into 60 tabbed categories. Some are very broad, like cleaning supplies, because they aren’t items that I usually purchase in store (I have an outside company that I get them from). Some are broken down quite a bit because I buy a lot of them. 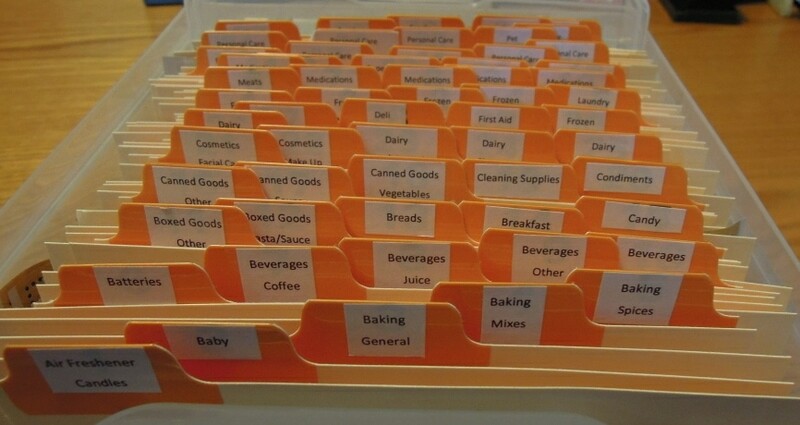 Labeled my tabs – Once you have your categories decided, print them out and cut them to fit your tabs. This was actually a very quick process. Clipped my coupons – This was the most time consuming part of the process since I had almost a year worth of inserts to go through and I have multiple copies of the inserts. I went page by page through the inserts and stacked the pages so I could cut multiple pages at once. There is some debate on clipping your coupons….Should you stack them? Should you cut them one by one? Should you hand cut them? Should you use a paper cutter? This is a decision you are going to have to make for yourself. **You will also decide on what coupons to clip….Clip them all? Clip only the ones you may use? I only clipped coupons for products that I knew that I would use or there was a possibility of me using. For instance, I don’t have carpet so I don’t need carpet cleaning supplies. Filed my coupons – Now I had piles of coupons that I needed to file, this was something great for me to do while I was sitting at home, watching some of my favorite shows. **Now if you are like me, your box may be overfull with coupons. This wouldn’t work for me so I went back through my coupons to double check to see if there is anything else that I really wouldn’t use. For example, after a second glance, I got rid of my coffee coupons. I don’t drink coffee and my husband is very particular about his coffee so why hold on to coupons for products that I would never use. What did I do with the little boxes? I labeled them with the stores I frequent and placed the store specific coupons in them. It fits in my purse so when I am going to a particular store, I just grab that store’s box and my coupons and go. They also work great for organizing the coupons that you know you are going to use when you are out shopping. I still pre-plan my trips and gather the coupons that I know I will be using and bring my box for the unexpected deals and the plans that fall through. How did the box work when put up to the test? I took my box into Target the other evening and it worked great. It fit nicely in the cart and I found my categories worked perfectly. I was able to capture unexpected deals and it was great. I was happy that I did all the planning on the front end because it led to a wonderful couponing experience with no stress and no frustration. How do I maintain this system? 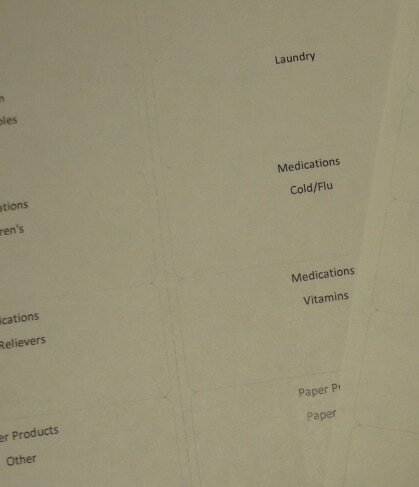 In order for me to continue to have a system that works well for me, I have to make the time every week to sit down with my new inserts to clip the coupons and file them. In addition, I need to make sure that I purge expired coupons on a weekly basis. I am very excited to have had the opportunity to share this journey with you. For some of you this is old news or you already have a system that works well for you. For others, you are transitioning from a newbie couponer and are ready for the next step. I hope this helps you on your journey. There are systems out there that you can buy but they aren’t tailored to you or your needs. If you spend a little time planning it out, you can spend a lot less money and have a system that fits your needs exactly. Let me ask you this – What system do you use right now? Does it fit your needs? Could your system use a makeover? Great post! I just left this system for a bit (I almost always have an infant and toddler with me) to two small accorrdian folders…one household, one grocery. I can fit both into my purse, my toddler can’t drop them, and I don’t feel the stare down of others from the binder system. I will have to bookmark this for when I get back to a box! You are so much more organized. Thank you for this post! I am just starting and trying to decide on a system that will work. Melisa made a great point about kids in the cart so I much just try the folders for now and see how that goes but this is a great reference for categories!! That is exactly why I can’t lug my binder around, I have a 10 month old to cary, and a 3 year old’s hand to hold, while focusing onthe ad and deals. I seem to save more when I just go in for what I want and get out, and not fish around for extra deals. I feel your pain on the little ones and shopping. I can’t bring the box into the store and effectively shop with my little ones. When I know that I will have my boys with me, I just pull out the coupons that I need and run in and out. I do try to do the majority of my shopping in the evenings and the weekend when my husband is home so I can go alone. Seems like a great system. I have tried baseball card insert binder, slipsheets for the entire insert, and they are both just not working for me. So, it looks like I might try this. Some times I get 50 copies of a red plum handed to me. I don’t use them ALL, but just in case, I don’t rid them until they are expired, also. I seems to only have room to put them in stacks in a box in my kitchen. So far that box belonged to my son’s brandnew packs of diapers. It’s tacky and odd, and I have to find a solution. Thanks for the great ideas! I use the binder but dont bring it inside the store… I’m 3 weeks behind on clipping right now, ugh! I really like the way your box looks… Just don’t drop it! Also, how time consuming is it to flip thru a category before you find the needed coupon? To be honest it really doesn’t take me too long to look for what I need. Since I am only clipping what I would actually use or be willing to try, I have a pretty good idea of what is in there. That’s the benefit of keeping up on the box regularly. You always have a good idea of what coupons you have. Thanks for the post! I have been considering starting to clip and file, my MIL will sometimes give me coupons she thinks I could make use of, and I will sometimes flip threw the ads and coupons in the paper when I need to get something and there might be a coupon for it. I have one of these photo boxes (for photos) and love it. I also have the tabbed dividers 3×5 and 4×6. I know labeling the tabs is a personal decision depending on your shopping habits, but could you share your tabs with a newbie? I start to think of some and then get way overboard. Or maybe there is a site for suggestions? Thanks for the idea, I should really start couponing more often! I have just one small accordian folder, but it works for me. One thing I recently changed with my clipped coupons was to keep them in chronological order by expiration date. So no matter what the category, I can flip to that slot & know the front coupons are the ones that expire first. Makes it a whole lot easier when you have to go through & pull out the expired one to toss. I really like this idea Stephanie. I may have to start arranging my coupons like this under each tab! I have a system similar to your old way of filling whole inserts by date. I also have a small box for coupons that I print, get in the mail, etc. I am really excited about the newest thing I’ve started to do, I got plastic envelopes with a zipper on top (about 5×10 inches) and use these for each store that I regularly shop at. I keep all my store coupons, catalinas, etc in each seperate envelope and then as I come across a deal online or in an ad, I clip the coupons needed and stick them in the appropriate envelope. It only takes me a few minutes to write up my list and organize things before I go shopping because I already have clipped my coupons! done just a few weeks ago….